ONE OF THE BIGGEST movie hits of the seventies made the expression "Love means never having to say you're sorry," a popular cliche. But while the treacly "Love Story" left a trail of wet tissues from coast to coast, it would seem that its message went heeded. In contemporary America and elsewhere, it seems as if everyone is apologizing for something they or their ancestors did. One would have thought we are on the eve of Yom Kippur instead of Passover in the last month as prominent personalities lined up to fess up to their imagined or real guilt and others demanded apologies for their wrongs. Still others were unrepetentant or forgetful. Here are a few of their stories. 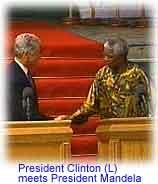 The most famous of the recent apologies came from President Clinton on his safari to Africa. Given the fact that his guiding personal philosophy has been "Being president during an economic boom means never having to say you're sorry," about his personal behavior, he would seem an unlikely serial apologizer. But his penchant for "feeling the pain" has also led him to add penitential posturing to his repertoire. A lot of the commentary concerning his trip concerned whether or not he would apologize for America's role in the slave trade. Predictably, many on the right inveighed against the idea while the left was in favor. I, for one, have no problem with such an apology. What's wrong with Clinton expressing "regret" for the legacy of slavery? It was evil and Americans put up with it far too long, even if we did eventually atone for it in a bloody war. What was unfortunate was that the debate over apologizing (and the less defensible idea that African-Americans should get some sort of reparations) was not used as a way of shining a spotlight on the fact that slavery is not entirely dead. Reports of this pernicious institution still living on in some African countries -- in particular the Sudan where Christians have been oppressed by the Muslim majority -- have been ignored by the mainstream press. Lamenting the horrors of the Middle Passage is a fine thing. But doing something about outrages in our own time requires more political courage. The worst moment of Mr. Clinton's trip came when he was publicly lectured by Nelson Mandela, the president of South Africa, for daring to ask Mandela to stop playing footsy with rogue regimes in Iran, Libya and Cuba. Because they supported his struggle, Mandela feels he is honor bound to support them now, no matter what the rest of the world says. Mandela has rightly gained the status of an icon of liberty for his suffering under the apartheid regime and for subsequently bringing that nation to democracy. But why does he think that those who suffer under Quaddafi, the Ayatollahs and Castro are any less deserving of human rights than his own people? And what makes his decision to support those tyrants any less cynical than the realpolitik practiced by the U.S. in past decades? And why should we trust his private diplomacy instead of sanctions when it was sanctions that helped bring his oppressors to heal? Another person who owes somebody an apology is former President Jimmy Carter. Carter, a man who raised self-righteous behavior to Olympic levels during his presidency has been working overtime to polish his stained-glass image since he was booted from office. Much of what he does for the homeless and other causes is wonderful, but I'll admit that his non-stop do-gooding is a bit hard to take. But a recent news item put him back into perspective. According to a new book by historian Douglas Brinkley, Carter has been acting as an advisor to Yasser Arafat. According to Brinkley, who had access to Carter's papers in his research, Carter told Arafat to justify Palestinian Arab violence and rioting during the intifada by saying: "The intifada exposed the injustice Palestinians suffered, just like Bull Connor's mad dogs in Birmingham." Somehow I don't recall Martin Luther King, Jr.'s non-violent marches for racial justice in the south including firebombs, stone throwing and murder. Carter owes the people of Israel and especially the hundreds of Jewish victims of intifada-related violence an apology. Carter's pal, Yasser Arafat, got a little free publicity the other day by visiting the Anne Frank House in Amsterdam. Reportedly, the visit was low key and the man who has the blood of many other Jewish children on his hands managed not embarrass his hosts too much. But ironically, that same week a report on the children's programming on Palestinian Authority Television came to light. No, I'm not referring to the new Arab-Israeli "Sesame Street" TV program produced by Israeli Educational TV and a private Palestinian group which has been praised for its promotion of co-existence. Rather, it is the official state TV of Arafat's Palestinian Authority - The Palestinian Broadcasting Authority. In their version of "Sesame Street," called the "Children's Club," young children are encouraged to read poems about jihad praising suicide bombers! That gives the lie to those who think that Mr. Arafat's concern for the lives of Jewish children will be expanded by Holocaust tourism either in Amsterdam or Washington. It is also an egregious violation of the Oslo Accords which specifically forbade that kind of propaganda. Even worse, the station that broadcasts it has received half a million dollars in equipment and training from the U.S. government! Another apology in the news is the long putt off recognition of African- American renaissance man Paul Robeson. A legendary athlete, singer, actor and activist, Robeson was cruelly treated by America because of his race. A symbol of black resistance to Jim Crow, Robeson's legacy of performance and dignity is being celebrated by many in this, the centennial of his birth. He was owed an apology for much injustice, even if it comes 22 years after his death. But amid all the Robeson hoopla in the media, one unfortunate incident in his life deserves airing, even if it does tarnish his image. Robeson was a life-long Communist. His loyalty to the cause of the Soviet Union may be excused by some because he naively saw it as an alternative to the racial injustice that flawed American democracy. But unlike many American Communists who could claim that they knew nothing of the atrocities of the Soviet Empire, Robeson knew better but kept silent anyway. In 1949, during one of his visits to Russia, Robeson asked to see the Yiddish poet Itzik Feffer. Feffer, along with the actor Solomon Mikhoels and other prominent Jews were victims of the latest anti-Semitic purge by Stalin. They had been hosted by Robeson during a World War II visit to the U.S. as part of Stalin's Jewish "Anti-Fascist" Committee and the great singer had been urged to intervene on their behalf. Mikhoels and most of the other Yiddish artists were already deep in the Gulag or dead by the time Feffer was brought from the Lubyanka prison to meet with Robeson, according to the well documented account in Louis Rapoport's history Stalin's War Against the Jews (Free Press, 1990). Though he had been cleaned up and dressed in a suit, Feffer's fingernails had been torn out. Though he couldn't speak openly, Robeson later told his son that the poet indicated by gestures and a few handwritten words that Mikhoels had been murdered on the orders of Stalin and that the other Jewish prisoners were being prepared for the same fate. After the two friends said goodbye, Feffer was taken back to the Lubyanka (the same place where Natan Sharansky and other refuseniks would be imprisoned decades later). He would never be seen alive again. Unlike others in the know, Robeson had nothing to fear from the KGB if he spoke out. He could always go home to the U.S. and then speak out. But instead, he continued to lie on behalf of Stalin. The same year he was publicly telling Americans there was no such thing as anti-Semitism in the Soviet Union! Why this hypocrisy? Robeson made his son vow not to make the story public until well after his death, "because he had promised himself that the would never publicly criticize the USSR." Robeson never apologized or repented for his silence. Although he was a great singer, he was also a slave to an evil ideology that sanctioned such lies. It seems to me that this part of his character ought not to be ignored by those who celebrate him today. Robeson's moral blindness to the oppression of others ought to be remembered just as much as the injustices done to him because of his race. Being a victim yourself doesn't mean you have the right to allow others to suffer.